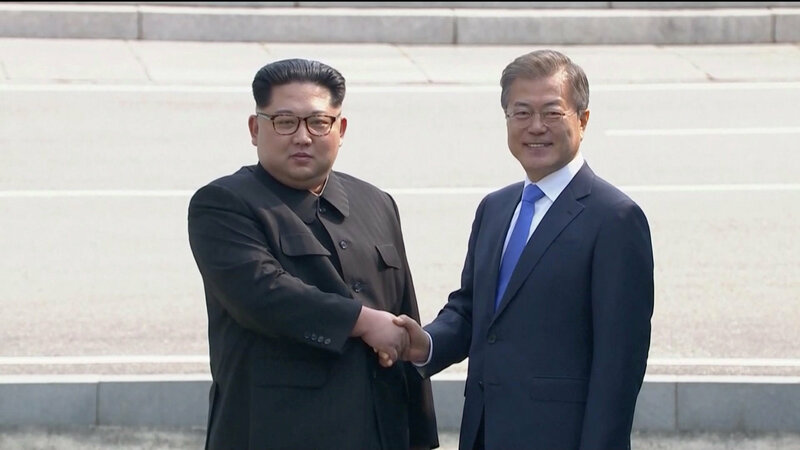 In a historic summit that few could have imagined just months ago, North Korean leader Kim Jong Un and South Korean President Moon Jae-in announced Friday the opening of “a new era of peace” that would end the Korean War and achieve a nuclear-free Korean Peninsula. But the grandiose pronouncements in the so-called Panmunjom Declaration was scant on details about how this would actually be done and mirrored a previous vow to rid the Korean Peninsula of nuclear weapons. 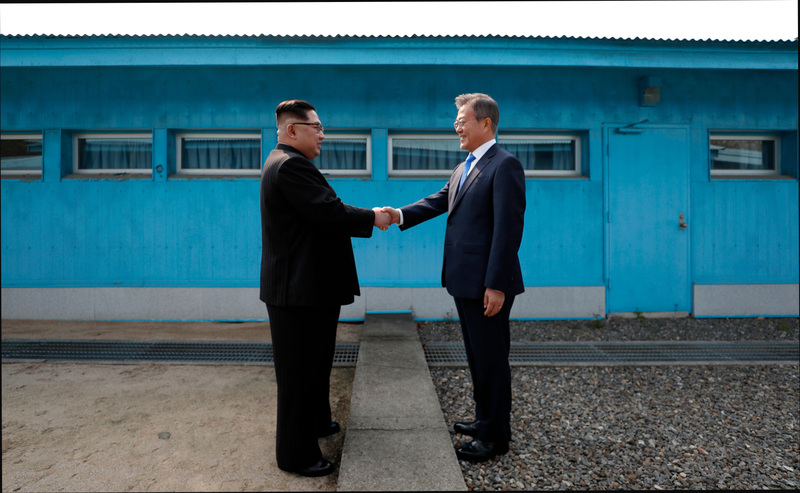 Indeed, the two Koreas had agreed to denuclearize the peninsula and establish a permanent peace there in their two previous summits in 2000 and 2007. Still, while kicking the can down the road to a U.S.-North Korean summit planned for either May or June, the Moon-Kim talks were likely to have jump-started the long-stalled peace process, a possible stepping stone to the nuclear issue. At a joint news conference on the steps of the Peace House building on the southern side of the truce village of Panmunjom, the two leaders laid out a series of plans and aspirational goals to bring the two rivals closer, with Moon calling the joint declaration an important agreement that will help formally end the Korean War and denuclearize the Peninsula. Kim, standing next to Moon, vowed to make efforts to implement the agreement, along with those reached in previous inter-Korean summits. “We will work to make sure without fail that (the agreement) will bear good results through close communication between us two so that the failure to implement North-South agreements in the past will not be repeated,” he said. 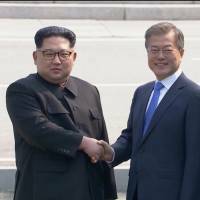 According to the joint declaration, the two countries will push for a permanent end to the Korean War this year, 65 years after the hostilities ended in an armistice, rather than a peace treaty. The two Koreas will seek meetings with the United States and possibly China — both signatories to the cease-fire — “with a view to declaring an end to the War and establishing a permanent and solid peace regime,” the declaration said. “After a furious year of missile launches and Nuclear testing, a historic meeting between North and South Korea is now taking place,” Trump tweeted after the leaders of North and South Korea agreed to pursue a permanent peace and the complete denuclearization of the divided peninsula. “Good things are happening, but only time will tell!” he added. China also praised the leaders of North and South Korea for the “political resolve and courage” they displayed at their landmark summit. Speaking at a regular press briefing, Foreign Ministry spokeswoman Hua Chunying voiced hope that the meeting will lead to a lasting peace. “We applaud the historic step the two leaders strode and compliment the political resolve and courage they have shown. We sincerely hope the meeting can yield positive results,” Hua was quoted as saying by the official Xinhua News Agency. 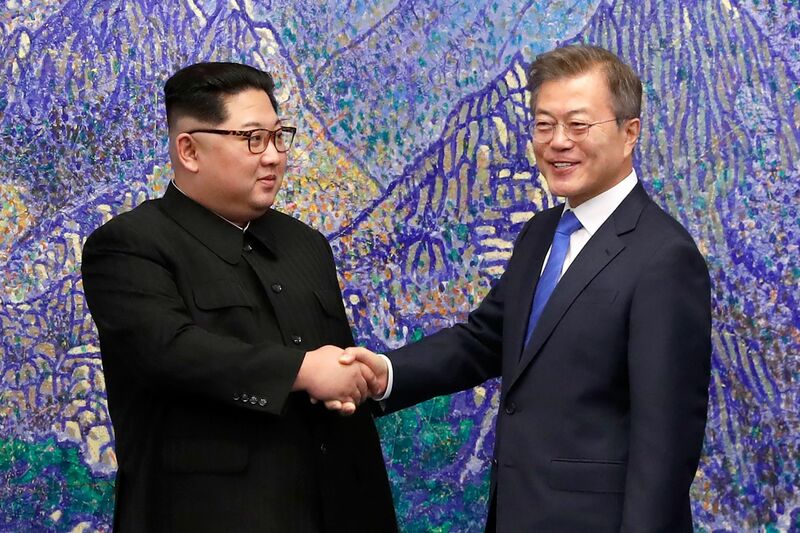 Moon said he will visit Pyongyang “in the fall,” and the two leaders also agreed to hold “regular meetings and direct telephone conversations” so as not to dampen the momentum. The declaration also said the two countries would establish a joint liaison office in the city of Kaesong to smoothly ensure civil-sector exchanges and cooperation, and would hold reunions of separated families on the Aug. 15 Liberation Day holiday, which marks the defeat of Imperial Japan in World War II and the end of colonial rule. Hours before the joint news conference, Kim crossed the heavily militarized border with the South, becoming the first leader from the reclusive nation to set foot in the rival country since the 1950-53 Korean War. 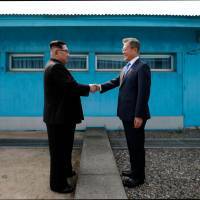 The meeting came after a year that saw the odds of conflict surge to levels not seen in decades as the North unleashed a spate of missile tests, conducted its most powerful nuclear test to date and traded threats and barbs with the United States. But, after months of improving ties this year, the atmosphere of the meeting Friday was markedly relaxed and positive. 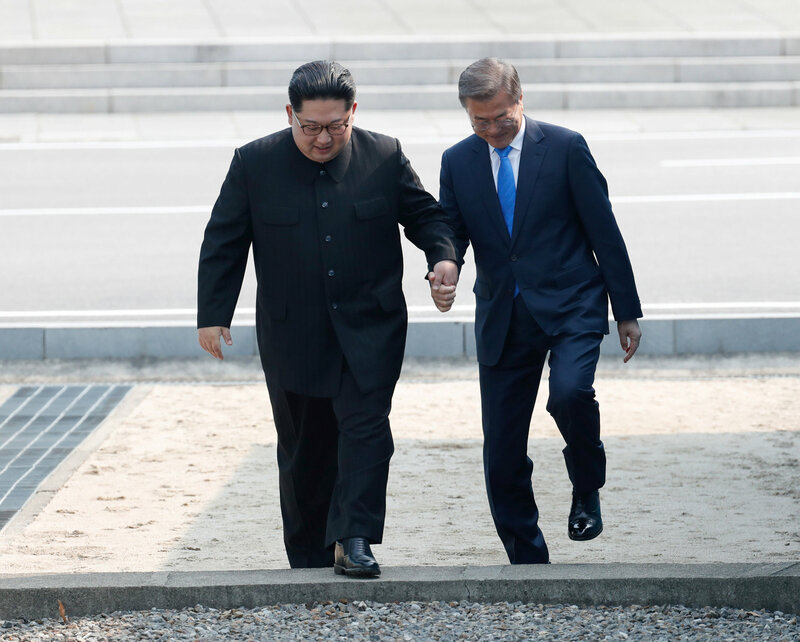 This was seen almost immediately, as the two men — at Kim’s impromptu invitation — briefly crossed hand-in-hand into the North before walking to the Peace House building. 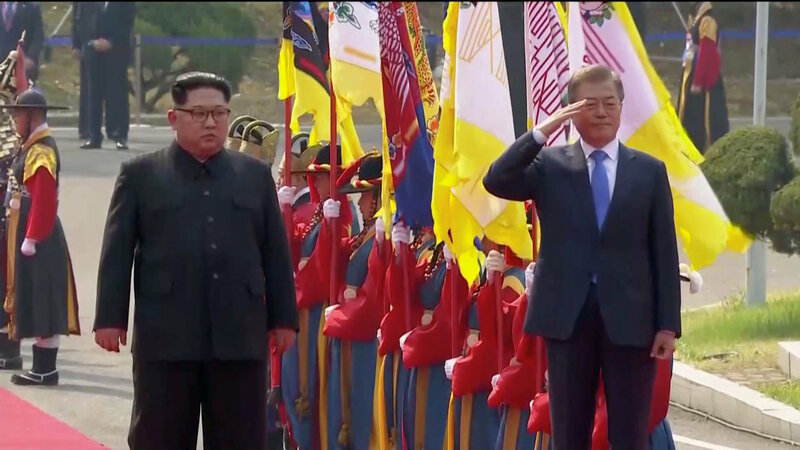 The two leaders’ budding rapport was also on display earlier in the day, when, according to Moon spokesman Yoon Young-chan, Kim joked that he would make sure not to interrupt Moon’s sleep anymore, a reference to the North’s spate of early morning missile launches last year. Kim also mentioned defectors and displaced people, as well as a South Korean island that was shelled by North Korean artillery in 2010, saying that he had high hopes the summit will help heal past scars. After the end of the first session of talks, the pair departed for lunch separately. Later in the afternoon, Yoon delivered a brief summary of the morning’s “sincere, candid” closed-door talks, saying that they had lasted exactly 100 minutes. The two also attended a tree-planting ceremony and unveiled a monument at the border as the afternoon session of their summit got under way. 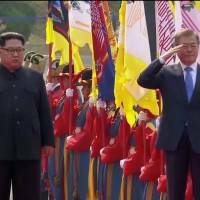 Kim and Moon shoveled soil on the roots of the tree and unveiled a stone marker that read, “planting peace and prosperity” above the leaders’ names and official titles. After that, the two took a stroll before sitting down for a lengthy and animated private conversation and then heading to the Peace House for the second round of talks. After their joint news conference, Kim and Moon’s wives joined them for a dinner on the South’s side, before lavish farewell ceremony. 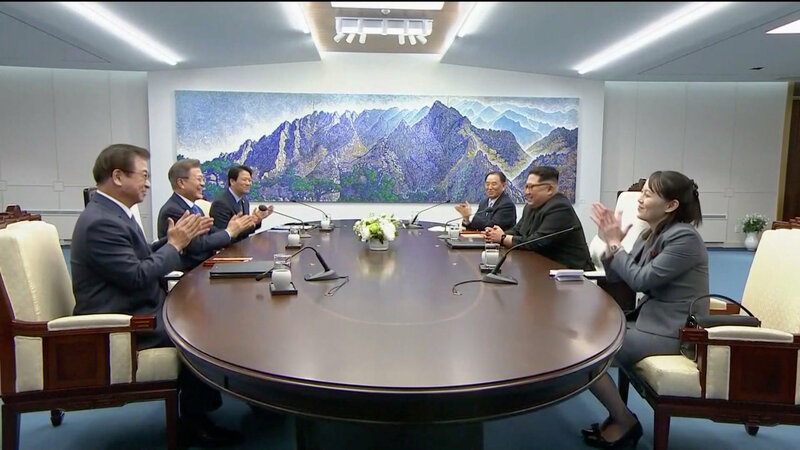 At the ceremony, Kim and Moon firmly grasped each other’s hands, as photos of their summit were projected onto a massive screen installed in front of the building where they met. The summit came after a sudden diplomatic flourish orchestrated by Moon. It also came after Pyongyang’s sixth and most powerful nuclear blast last year, as well as the launches of more than 20 missiles, including two longer-range weapons that flew over Japan and another that experts say puts the whole of the United States within striking distance. Friday’s meeting was just the third of its kind after two in Pyongyang, the last being held more than a decade ago. Moon had previously talked of a “peace regime” for the two countries, part of a plan unveiled in his so-called Berlin declaration made during his visit to the German capital last July, about two months after taking office. 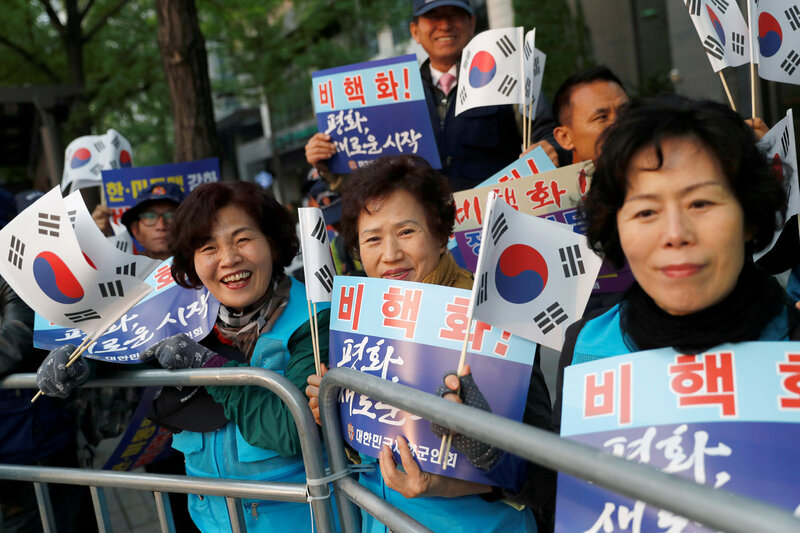 Under that declaration, he pledged to pursue the North’s denuclearization with assurances of a security guarantee and economic and diplomatic incentives while also seeking a peace treaty. Trump has given his “blessing” that the two Koreas could seek a peace deal, if North Korea agreed to give up its nuclear arsenal. 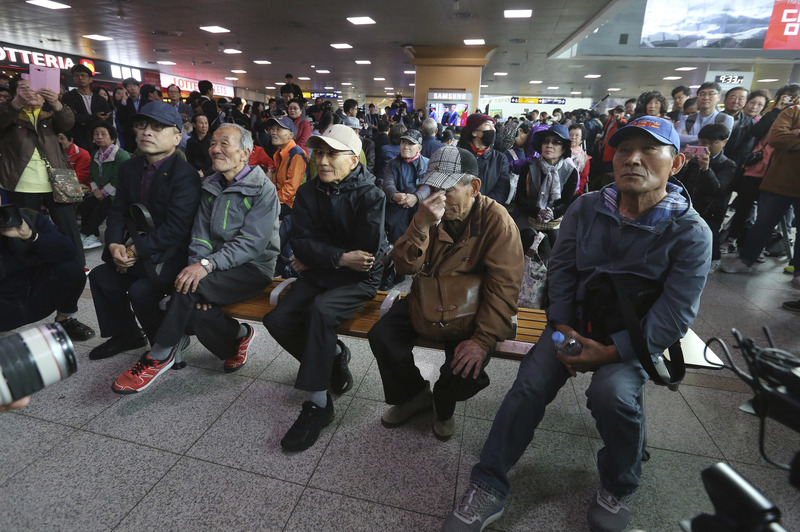 South Korea and a U.S.-led U.N. force are technically still at war with North Korea, and because Seoul is not a signatory to the 1953 armistice, it is not possible for the two Koreas to announce an end to it, observers have said. Over the weekend, Pyongyang announced a moratorium on nuclear tests and intercontinental ballistic missile launches as well as the closure of its main atomic test site, with Kim saying it had completed its goal. The South hailed that move as “meaningful progress” toward the ultimate goal of denuclearization. 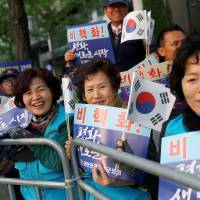 But the North has declared moratoriums before, and has also talked about denuclearization, while previous agreements have ended up foundering. Kim has kicked off a coming-out party of sorts over the past two months, meeting with officials from the South for talks that helped pave the way for Friday’s summit and the planned Trump meeting. In that time, he has made his first trip outside the country since becoming North Korean leader in 2011, meeting Chinese President Xi Jinping in Beijing, while also holding court in Pyongyang with the head of the International Olympic Committee and later taking in a performance by some of rival South Korea’s top musical stars. North Korea’s diplomatic push has also prompted talk of Kim meeting with other world leaders, including Prime Minister Shinzo Abe, who is eager to see progress on the issue of abductions of Japanese citizens in the 1970s and 1980s by North Korean agents. Fearing that it may be left behind, Japan has informed North Korea of its desire to hold a bilateral Kim-Abe summit through several channels since February, according to media reports quoting sources close to bilateral relations.